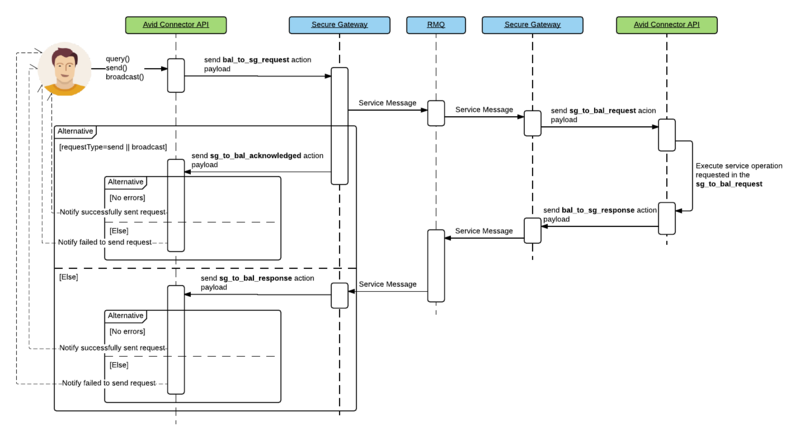 When Secure Gateway receives payload with bal_to_sg_request action, it sends Service Message having request over the RabbitMQ, which will be consumed by another (or same) instance of the Secure Gateway. When Secure Gateway receives Service Message having request, it sends payload with sg_to_bal_request action to Avid Connector API. When Avid Connector API receives payload with sg_to_bal_request action it must execute corresponding service operation with provided parameters. When result of the operation received, Avid Connector API must send payload with bal_to_sg_response action, having result of the executed operation. When Secure Gateway receives payload with bal_to_sg_response action, it sends Service Message having response to RabbitMQ, which will be consumed by another (or same) instance of the Secure Gateway. When Secure Gateway receives Service Message having response, it sends payload with sg_to_bal_response action to Avid Connector API.